Meets Highway Traffic Act specifications. 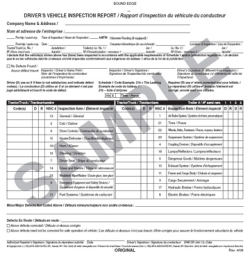 Canadian DVIR - for compliance with National Safety Code 1, 3, 5 Schedule. 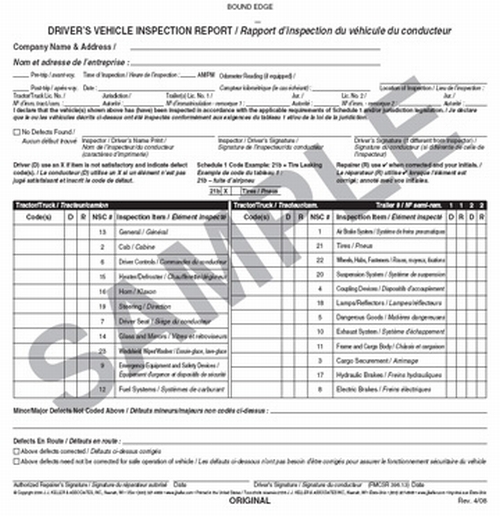 This detailed DVIR Canadian Driver's Vehicle Inspection Report helps drivers spot parts in need of repair. J. J. Keller's nine point Vehicle Inspection Procedure - Walkaround Sequence. Book format has 31 sets of DVIR forms per book plus carbon (30-B, 31-B). Book format has 31 sets of 2 ply carbonless forms (734-B, 734-B-C Imprinted). English/French version book (30-B) is 8-1/4" x 8-1/2" large format for easy entries. English only books (31-B, 734-B, 734-B-C Imprinted) are 5-1/2" x 8-1/2"